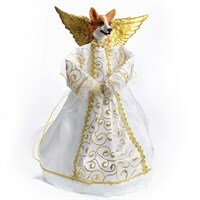 Warm the cockles of your heart and your hearth with the cherubic Corgi Angel Christmas Tree Topper. This divine dog will light up your home and holidays on an 11 inch, gold trimmed silk Corgi Angel Christmas Tree Topper for your tree or mantle. You can give these Corgi Angel Christmas Tree Toppers to friends, family and coworkers for a low, affordable price. With a face made of sturdy polynate, you will cuddle up to this Corgi for many years to come. Make it a new family tradition with the celestial sweetness of this dynamic, darling dog. Beautifully hand painted, this delightful Pembroke Corgi Bottle stopper will be the talk of the party at your next get together. At approximately 1½" to 2" tall, our intricate Pembroke Corgi Bottle stopper looks just right sitting atop just about any bottle. Weather a gift for a dear friend or family member or simply a new decoration for your home, all Corgi lovers will surely enjoy this gorgeous stopper. 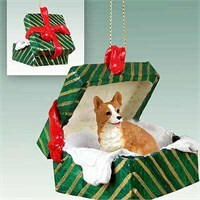 Deck your halls and trim your tree with this sweet and colorful Corgi Gift Box Christmas Ornament Pembroke. Our Corgi Gift Box Christmas Ornament Pembrokes are crafted from fine quality stone resin and feature a beautiful full color figurine. All of our Christmas ornaments are crafted for a lifetime of memories and make wonderful gifts, and these beautiful Corgi Gift Box Christmas Ornament Pembroke are no exception. 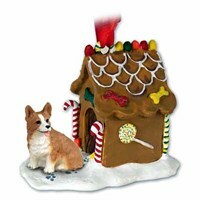 Deck your halls and trim your tree with this sweet and colorful Corgi Gingerbread House Christmas Ornament Pembroke. Our Corgi Gingerbread House Christmas Ornament Pembrokes are crafted from fine quality stone resin and feature a beautiful full color figurine. All of our Christmas ornaments are crafted for a lifetime of memories and make wonderful gifts, and these beautiful Corgi Gingerbread House Christmas Ornament Pembroke are no exception. This magnificent Pembroke Corgi Note Holder will make sure that you never forget that important meeting. At approximately 6 x 2.5 inches our friendly Welsh Corgi Memo Holder will always stand out on your kitchen counter, desk or anywhere else you decide to place it. 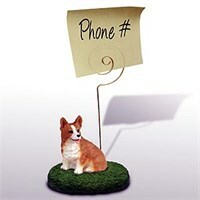 Or as a gift for a friend or loved one, this delightful Welsh Corgi Note Holder will always bring a smile. Nothing beats the exceptional look and quality of our Corgi Cookie Jar. Among the finest made, you will be provided with great satisfaction and long lasting enjoyment. Why not pamper yourself or give a loved one a Corgi gift to show them how much you care. The Corgi Cookie Jar will make the perfect gift for any Corgi lover. Shop with confidence, because all products come with a 100% customer satisfaction guarantee. Click over now to see the big selection of Corgi gifts we offer. 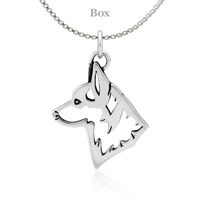 Our Sterling Silver Corgi Pembroke Head Necklace are hand made and made of .925 Sterling Silver. 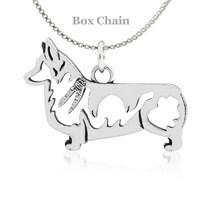 Our Sterling Silver Corgi Pembroke Necklace are hand made and made of .925 Sterling Silver. Nothing beats the exceptional look and quality of our Corgi Pillow. Among the finest made, you will be provided with great satisfaction and long lasting enjoyment. Why not pamper yourself or give a loved one a Corgi gift to show them how much you care. The Corgi Pillow will make the perfect gift for any Corgi lover. Shop with confidence, because all products come with a 100% customer satisfaction guarantee. Click over now to see the big selection of Corgi gifts we offer. This spectacular Pembroke Corgi Pen Holder will spruce up any desk or work station. With a beautiful wood plaque mount, an intricately designed figurine and a handsome gold tone pen, your new desk accessory is sure to bring up lots of conversation about your favorite friend. 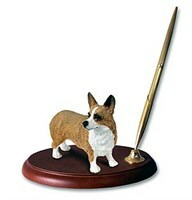 The Welsh Corgi Pen Holder is always a fantastic gift. 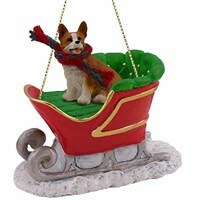 Deck your halls and trim your tree with this sweet and colorful Corgi Sleigh Ride Christmas Ornament Pembroke. Our Corgi Sleigh Ride Christmas Ornament Pembrokes are crafted from fine quality stone resin and feature a beautiful full color figurine. All of our Christmas ornaments are crafted for a lifetime of memories and make wonderful gifts, and these beautiful Corgi Sleigh Ride Christmas Ornament Pembroke are no exception. 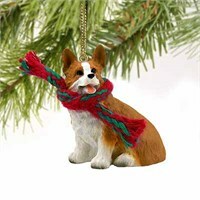 Deck your halls and trim your tree with this sweet and colorful Corgi Tiny One Christmas Ornament Pembroke. Our Corgi Tiny One Christmas Ornament Pembrokes are crafted from fine quality stone resin and feature a beautiful full color figurine. All of our Christmas ornaments are crafted for a lifetime of memories and make wonderful gifts, and these beautiful Corgi Tiny One Christmas Ornament Pembroke are no exception.